M got me a Kindle Paperwhite for Christmas and let's just say it has DRAMATICALLY increased my readership since then. I think I read more books between Christmas and New Year's Day than I read in the last few months. 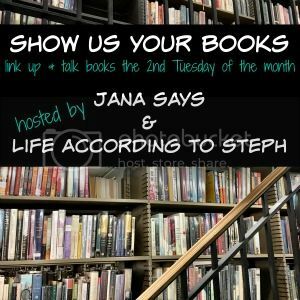 I'm linking up today with Steph and Jana! Not normally a fan of teen books I found myself quickly engrossed in the teenage saga of this book. A group of 16-18 year olds meet each other at a camp for...well...crazy kids. Some of the kids come from rough backgrounds and some show signs of mental illness. But they all have such intriguing stories and backgrounds that I couldn't help but continue on! The main character's "story" slowly comes to light throughout the book and it's really good. Four out of five salted caramels. I really loved this series, despite it being a young adult series. Here's an average girl who has always had the ability to read minds, but she soon discovers her "powers" aren't quite what she thought and she's now a target for a lot of powerful people. Allegiances switch back and forth and you never know who to trust. Family secrets are revealed and lives permanently altered. I couldn't put this series down! Highly recommend! Five out of five salted caramels. I was not a fan of this series. It was like Hunger Games meets Star Trek but not in a good way. I made it through about 1/4 of the book and stopped. No thank you. One salted caramel. Hehe you're making me want some salted caramels ;) The Mind Readers sounds good!! The Odds of Loving Grover Cleveland and The Mind Readers both sound like really interesting books! I'm a huge fan of YA, so I'll probably end up liking them. I hope that you get to read even more with your new Kindle! The Odds of Loving Grover Cleveland has been on my kindle for a while. I hope to get to it by the end of March! Yay for a new kindle-- the best kinds of books! Grover Cleveland is on my iPad to read, so I'm glad to hear you liked it! I love my Kindle! It's just so easy to grab and go and it's especially when you're reading a big book to not have to strain muscles. LOL! I'm adding The Odds of Loving Grover Cleveland to my TBR! The Odds of Loving Grover Cleveland seems like a book I'd enjoy! I'm going to need a Kindle at some point. My iPad is on its last legs and I don't think I want another one but I do need an ereader. bummer about fate of perfection, hunger games and star trek does seem interesting lol. adding The Mind Readers to my list! The Odds of Grover Cleveland sounds interesting. I love my Kindle Paperwhite! I told Chris I want a Kindle Paperwhite a few years ago, and he thought I was just being modest and got me the Fire. I was like, no, I actually want the Paperwhite! lol. So he got to keep the Fire and I got the Paperwhite for my next birthday. Thanks for sharing! I don't think I've heard of any of these, and I LOVE YA titles. I do think that having a Kindle Paperwhite means I get to read more different types of books, since so many are e-book only. Oh I want to check out the Mind Readers series! I need to check out the Kindle Paperwhite. I have the iPad which I read on, but I have been going back and forth on whether to keep that or eventually move back to a proper kindle! I don't always read YA, but when I do, Grover Cleveland sounds exactly like the kind that I'd enjoy. Adding it. The mind reading book sounds good!